From humble beginnings as a small farming village, Val d’Isere has developed into one of the most famous modern alpine resorts in the world whilst still retaining much of its traditional ambience. Universally popular with tourists from all nations, Val d’Isere has all the facilities needed for any kind of holiday - lively bars and luxurious shops sit next to classic French patisseries - whilst a modern sports centre with swimming pool and gym, plus an ice driving course and skating are also available. 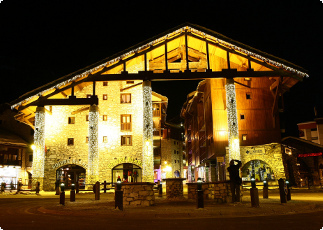 Made up of the main Val d’Isere town, with the apartment-block heavy village of La Daille and the more rustic Le Fornet at opposite ends - one main road runs through the resort with the vast majority of shops, restaurants and bars running off it. Sharing the 300kms of pistes in the Espace Killy with Tignes, Val d’Isere has some of the best snow conditions in France and has an excellent snow record throughout the whole season. It enjoys a justifiable reputation as a great resort for intermediate and advanced skiers, with easily accessed and challenging off-piste sections as well as a large snowpark. High capacity, fast ski lifts also mean very few queues and great connectivity on all points around the mountain. Geneva airport is the main transport hub for travellers going to Val d’Isere, and Snowbus operate a cheap and convenient shared transfer service between the airport and ski resort. From just £49pp our regular scheduled bus service is ready to take you between Geneva and Val d’Isere on Wednesdays, Fridays, Saturdays and Sundays throughout the ski season. With stops in Val d’Isere Centre, La Daille and the UCPA (for Le Fornet) we offer one of the cheapest transfer methods around. Private taxi transfers are also available for larger groups and families as a door-to-door travel option at any time. Snowbus are proud to offer our fantastic shared transfer service from Grenoble airport to Val d’Isere on Saturdays throughout the winter. With 10 buses running at regular intervals you can be sure of when you will be travelling and fit it in around your flights for incredible convenience at a cheap price. With stops at Val d’Isere central bus stop, La Daille and the UCPA building the Snowbus shared transfers get you as close to your hotel as possible at the lowest cost possible. Private transfers for groups of up to 19 passengers are also available in our large minibuses so your whole group can travel together at any time. Snowbus operate a full private taxi transfer service between Chambery airport and Val d’Isere ski resort. With direct travel arranged around your flights this represents the quickest and easiest method of travel for families and groups of friends. Child seats are also available for no extra cost, and we have plenty of space for all the luggage you could possibly bring. 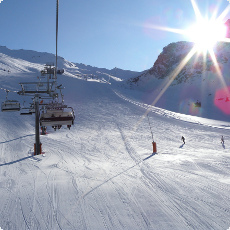 Private transfers between Lyon airport and Val d’Isere resort operate at any time and day during the winter ski season. As the easiest method of travel to / from Lyon - minibus travel for just your group offers the ultimate in convenience as our drivers will meet you directly from your flight. Offering good value for money for mid - large size groups, Snowbus private journeys are a great way to start or end your ski and snowboard holiday.